بخشنده امنیه, حسن, بهادری, معین. (773). تأثیر لرزش زمین ناشی از عملیات انفجار تونل‌های آبرسان و مخازن بر سازه‏های زیرزمینی سد گتوند علیا. مجله ژئوفیزیک ایران, 5(2), 51-60. حسن بخشنده امنیه; معین بهادری. "تأثیر لرزش زمین ناشی از عملیات انفجار تونل‌های آبرسان و مخازن بر سازه‏های زیرزمینی سد گتوند علیا". مجله ژئوفیزیک ایران, 5, 2, 773, 51-60. بخشنده امنیه, حسن, بهادری, معین. (773). 'تأثیر لرزش زمین ناشی از عملیات انفجار تونل‌های آبرسان و مخازن بر سازه‏های زیرزمینی سد گتوند علیا', مجله ژئوفیزیک ایران, 5(2), pp. 51-60. بخشنده امنیه, حسن, بهادری, معین. تأثیر لرزش زمین ناشی از عملیات انفجار تونل‌های آبرسان و مخازن بر سازه‏های زیرزمینی سد گتوند علیا. 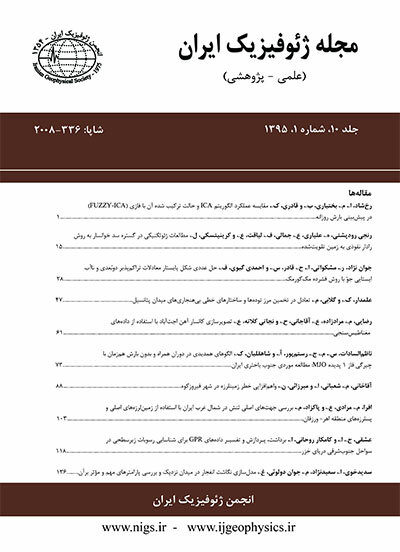 مجله ژئوفیزیک ایران, 773; 5(2): 51-60. لرزش زمین یکی از آثار جانبی عملیات انفجار است. معیار مهم در ارزیابی میزان خسارت ناشی از لرزش زمین، حداکثر سرعت ذرات است. به‌منظور بررسی اثرات امواج حاصل از انفجار در دهانه‌های آبگیر و مخازن ضربه‌‌گیر روی سازه‌های زیرزمینی و بتن‌‌ریزی سد گتوند علیا، 16 نگاشت 3 مولفه‎ای و درمجموع 48 رکورد حاصل از 4 انفجار ثبت شد. این عملیات با 4 دستگاه لرزه‌نگار PG-2002 با لرزه‌سنج‌‌های سه مؤلفه‌‌ای GS-11D در سه امتداد متعامد شعاعی، مماسی و قائم برداشت و با نرم‌‌افزار DADISP پردازش شد. با استفاده از فاکتور فاصلة مقیاس شده رابطه‌ای برای پیش‌بینی حداکثر سرعت ذرات ناشی از انفجار ارائه شد. این رابطه بر اساس ریشة سوم فاصلة مقیاس شده و ضریب همبستگی 85/0 است. دقت این رابطه‌ به‏کمک الگوریتم ژنتیک به مقدار 89/0 افزایش پیدا کرد. باتوجه به حداقل فاصله 2/56 متری سازه تا مرکز انفجار، حداکثر میزان خرج مجاز در هر تاخیر 4/254 کیلوگرم پیشنهاد شد. Ground vibration is an inevitable consequence of blasting operations in open pit mining and civil engineering projects. A large amount of energy is released in every blasting exercise in the form of wave propagation, which can cause serious damage to the surrounding environment. Safe design of blasting for underground structures and tunneling are nowadays carried out mainly based on the permissible peak particle velocity (PPV), which has become a major criterion in setting out the appropriate safety standards envisaged to prevent structural damage near such operations. Many published studies have produced correlations for PPV prediction using experimental data The Gotvand Olya Dam is one of the major civil engineering projects in the last thirty years in Iran, constructed as the last dam on the Karoon River with the aim of increasing environmentally friendly electrical energy of the country, seasonal flood control in the province, and a supply of agricultural water for the strategic farming grounds of Khoozestan. The geological formations of Gotvand include the two main formations of Bakhtiyari and Aghajari. The existence of discontinuities in these formations as well as joint sets and their low inherent strength caused a number of challenges in blasting design operations. This dam is 30 km north west of Shoshtar in the Khoozestan province, and 12 km away from Gotvand. In this study, 16 records of 3 components produced from 4 blasts were obtained using 4 seismographs of the type PG-2002 at Intac and surge tanks of the Gotvand Olya Dam in order to investigate their effects on underground structures. The three-component seismometers were of the GS-11D type and the records were analyzed using DADISP software. The explosion materials used were ANFO and dynamite, and the maximum weight of the explosions per delay in the Intac and surge tank were in the range of 32.0 to 343.3 kg. The positions of the seismometers were in the range of 56.2 to 145.5 meters away from the centre of blast blocks. The permissible peak particle velocity was taken from the Korean Institute of Geology, Mining and Materials. Using the scale distance, an exponential equation based on the cubic root of the charge weight per delay and coefficient correlation of 85% was proposed for predicting the PPV. In this relationship, the geological coefficients of the Gotvand area were estimated to be 20.339 and -3.08. Using a genetic algorithm, an improved coefficient correlation between the experimental and predicted PPV of 89% was obtained. The results from the genetic algorithm applied for the coefficients of a, b, and n in the equation of PPV=b(d/wn)a were -9.286849, 9.769703 and 0.745959, respectively. Considering this proposed relationship, the minimum distance of 56.2 m to the centre of the blast block and the permissible peak particle velocity of 254 mm/s for a 10 day old concrete, the maximum charge weight per delay was found to be 254.4 kg.